The fifth Sunday after Easter being the first day of the week in which the Rogation days occur, has taken its name from them, and is usually called Rogation Sunday. The striking appropriateness of the Gospel, which contains our Lord's words about asking in His Name, seems to indicate that it was either chosen for this day on account of its position with reference to the Rogation days, or that the latter were appointed to be observed on the three days following because the Gospel already distinguished this as the Sunday concerning Asking. Both the Epistle and Gospel are found in the Lectionary of St. Jerome; and as the Rogation days are generally said to have been instituted in the fifth century, the latter seems the more probable theory. The Collect has an evident connection with the purpose of the Rogation days; and so, perhaps, has the latter part of the Epistle. 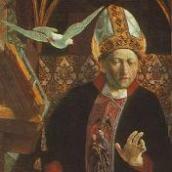 Bishop Cosin wished to insert a new rubric at the end of the Gospel, "This Collect, Epistle, and Gospel shall be used only upon this day."